The original Goppingen Go 3 Minimoa is a single-seat sailplane produced in Germany. It was designed by Martin Schempp and Wolf Hirth. This airplane established several records, including the world altitude record of 6,687m (21,939 ft) in 1938 in a thunderstorm. Richard du Pont and Chet Decker flew Minimoas to win the US Championships in 1937 and 1938. It was made out of wood and fabric with cantilevered “gull” wings. The Go 6 Minimoa MO2a was the only two seat glider to be built from the initial order of two in 1937. The second seat was built between the wings, behind the main wing spar to the extended fuselage. The front portion of the fuselage was extended by 260mm. The AP Model’s 1/5 scale version of this beautiful sailplane comes with the fiberglass fuselage and flawless finish in beige gel-coat. The canopy is removable with fiberglass frame and comes ready for completion. The wing is beautifully finished in scale like Solartex and ready for your aileron, and spoiler servos installation. The plug-in wings as well as tail parts are scale like, classic balsa/plywood construction, and easily removable for transportation. This model comes in two versions, ARF (Almost Ready to Fly) fully covered by Solartex iron-on fabric and ARC (Almost Ready to Cover) ready for covering of your choice. All these features give this model performance characteristic similar to a full scale airplane while still remaining very light and beautifully built. The synergy of low weight and strong structure is very unusual even in a custom production sailplanes and can only be achieved with careful attention to design and construction. This model is considered one of the best values on the market today. 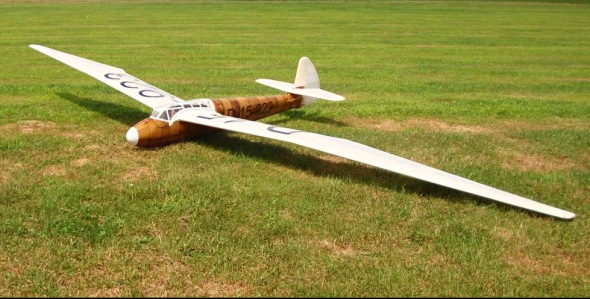 This modern, 1/5 scale model of full size Go 6 Minimoa with its fiberglass fuselage and its classic balsa/ply scale wings flies as well as full size sailplane. 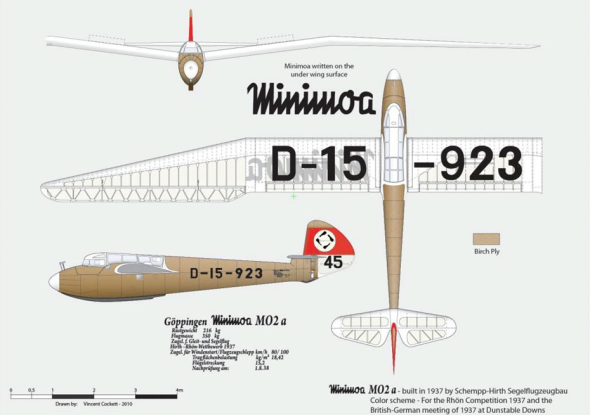 To this day only four Minimoas remain airworthy, two in Germany, one in Japan and the last one in the U.K.